OK, I had to take a little (much needed) break from writing. And what better way to prevent writer's block than by blogging? My thoughts exactly. Being on deadline to write my next article feels a lot like writing a college paper at the very last minute. I still procrastinate just like I used to and give myself "breaks" every five minutes to check Pinterest and Facebook. Not to mention, I sit on my couch, wrapped in a blanket and try to move from this position as little as possible. Because, if I do, I may never sit back down and finish writing. But to do all of this, I need my essentials. And yes, each of these is absolutely vital to my writing success. Well, maybe they aren't. Either way, I feel my writing is better when I have some of my favorite things. Notebook - A given for any writer. Notes/doodles galore. 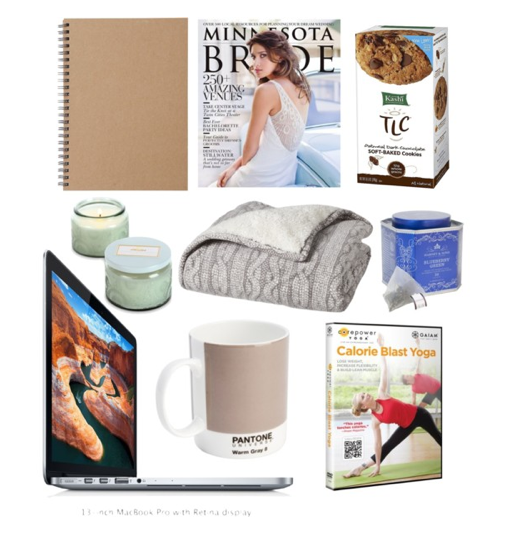 Minnesota Bride - Having the most recent issue is an absolute necessity. I need to keep on trend with what we're covering, and make sure that I don't write about something we recently featured. Kashi Cookies - MY FAVORITE. I love Kashi. They taste great, and they're great for you. (Well, maybe not great, but you get the picture.) For a cookie, they're pretty healthy. And I need chocolate. That is that. Candles - I was given the below candle as a gift for Christmas, and it is my absolute favorite. The scent is French Cade and Lavender (remember how I said lavender is my favorite?) The McCarthys know me so well! This candle seriously puts me in my zen place. Blanket - I do my writing on the couch. And it's currently March in Minneapolis. Unfortunately, that means it's still cold. Blanket = necessity. Tea - Currently obsessed with blueberry green tea. OBSESSED. Not to mention, caffeine is always a good thing. Macbook - I can't get anything done without this little baby. Mug - Whenever I'm writing, I drink endless cups of coffee/tea/water/juice/ANYTHING. It's probably yet another procrastination tool of mine, to continue filling my mug. Who knows. And with that, it's back to writing...See you soon!